The fast erosion of big game conservation in Africa may indeed be a canary in the coal mine for humanity. The world gasped at the callous shooting of Cecil the lion. Last year, 600 lions were shot for sport. Now the facts are out. 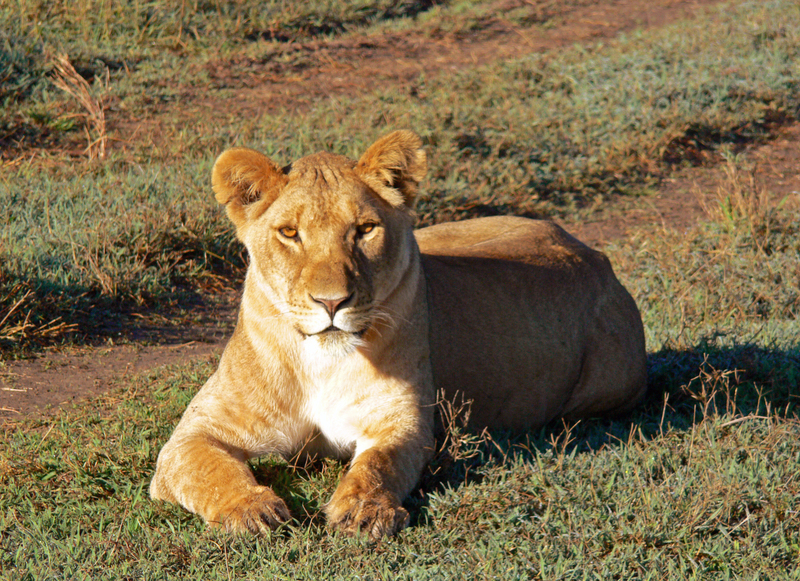 The lion population is down 50% since 1993. Ten years ago, 13 rhinos were poached in South Africa. Last year, it was a thousand. A rhino horn is worth more than gold; they sell for up to $500,000 a tusk in Asia. Stupid people believe the horns have “special powers,” while these rare animals are disappearing from the face of the earth. A decade ago, visiting the red oat plains of the Masai Mara, on the site of the great annual migration trail through Kenya and Tanzania, our guide pointed out Mary, a famous and extremely rare white rhino, calmly grazing near our safari vehicle. I shudder to think what may have become of her and her like since then. Study after study has shown that photo safaris are more economically beneficial to local economies than gun safaris. But modern land development and social change are likely even greater threats to the natural habitat of the great and small animals of Africa and other areas. Not making greater effort to conserve habitat for these fellow travelers on planet earth not only robs us of our humanity, but risks unbalancing the nature that sustains life itself. True conservation is difficult and expensive, yet so much easier to accomplish before all the worst is done. Even from the surface of the moon, you can see the 3,500 mile scar in the earth’s crust. It is one of our planet’s most notable features, extending from the Mediterranean Sea to South Africa. It is East Africa’s Great Rift Valley. It’s difficult to picture this natural landmark from here in Chicago, much less the wonder of abundance at the mid-point of the valley, the great Kenyan plain known as the Masai Mara. But I’ll try to help. The Masai Mara’s great migration was recently named by ABC-TV and USA Today as one of the Seven Wonders of the Modern World, and the only moving wonder. It is the annual destination for the world’s most diverse migration of grazing animals. From horizon to horizon, some 1.3 million wildebeests, 1⁄2 million gazelles and 200 thousand zebra, accompanied by armies of predators, move in an endless 700 mile circle with the seasons, following the rains, as they’ve done for millions of years. They course in their clockwise arc from Tanzania’s fabled, trackless Serengeti Plain, northward into Kenya, to forage in the rolling open savannah grasslands and wetlands of the Mara River, at the foot of the great rift escarpment. USA Today’s Bruce Feller says, “The Masai Mara transports you to a time when humans were secondary on earth.” Indeed. We once breakfasted shortly after dawn out on the Masai Mara, landing in a hot air balloon, as thousands of migrating wildebeests politely streamed around our field table, lowing in unison with a deep rumbling noise, said to resemble the growl of a fleet of Harley Davidsons. As you may already know, safari is the Swahili word for a journey, a journey that began after young Scottish geologist Joseph Thomson ventured where an army had refused to probe, and in 1883 became the first European explorer to pass through Maasai country. Our safari tonight begins in this area that was the birthplace of the big game safari. The area’s first recorded hunting safari took place in 1929. Today, the Masai Mara Game Reserve, a little smaller than Rhode Island, is Kenya’s most celebrated game park and is locally known as the Mara. An extended expanse, generally referred to as the “dispersal area” stretches north and east of the reserve. Maasai tribal communities, with their beloved cattle, live within the dispersal area, along with wild game of the Mara. This former warrior tribe of tall and red-robed people lives a pastoral existence. Their lifestyle often seems at odds with modern western traditions, as they tend to scorn the concept of agriculture and land ownership, and live in an ages-long symbiotic relationship with wildlife. The Mara Triangle, on the valley floor beneath the towering escarpment, in the hazy distance, is home range to one of the widest varieties of African game. For example, the scarce and beautiful Greve’s zebra, graceful Masai giraffes, extended African elephant families and bellowing black rhinos. Then there are grazing antelopes of all sizes and descriptions, what children on safari often lump together as “gazantelopes.” In particular, we see the blue wildebeest – sometimes called the gnu. It is a land of graceful gazelles, puppy-sized dic dics, furry waterbucks and the mighty eland, six feet tall at the shoulder. The Mara’s rivers teem with hippos and Nile crocodiles. The stomping secretary birds and ever-present warthogs and scavenging hyenas and jackals cover the ground, while chattering monkeys, stoic vultures and swooping storks inhabit the trees. It is known as the kingdom of lions. Cheetahs abound and even leopard can sometimes be spotted, dragging their prey up into a tree for safe keeping. We’ve even seen a rare and famous white rhino named Mary, chomping on the tall, red oak grass. That, along with statuesque red thorn acacia trees, gives the open plain a golden hue. Recent efforts to privatize land in the Mara are changing the way people have interacted with wildlife over the millennia. Since the 1970’s, these changes have caused a 60% decline in wildlife in the region, both inside and outside the game reserve. The great savanna of Eastern Africa – cradle of mankind, home to traditional nomadic pastoralists and their livestock, and last refuge of some of the most spectacular wildlife populations on earth – are in trouble. Notwithstanding 20 years of highly committed wildlife conservation, more than half of the big mammals of the Masai Mara have disappeared in this time. Incredibly, most could be gone in the next 20, if much more isn’t done. Tonight, we’ll take a close look at the interwoven relationship between big game tourism and conservation efforts in Kenya. You will join me as we come face to face with a troubling dichotomy — magnificent beasts in their ancient natural habitat encountering modern man and his machines. Of course, these days, at least in Kenya, such meetings are generally with camera in hand, rather than a gun. We’ll see some of the ironies of wildlife tourism and human development, both threatening and giving hope to the perpetuation of man’s natural heritage. And we’ll meet some of the magnificent creatures, human and animal, that make up an unforgettable visit, in these early years of the 21st century. Let’s meet some of them now, in what might be described, in a total departure from humility, as a truly charming, yet charmingly true, story of a memorable encounter. A “game drive” into the Masai Mara, the backdrop for the film, “Out of Africa,” is nothing – nothing — like a commute back home in the States. Evidence: the fleeting hitchhiker we picked up in an area of scrub brush a quarter mile off a dirt road, one afternoon. Our Land Cruiser driver had spotted, through his binoculars, what he thought was a solitary cheetah, resting in the grass. But our untrained eyes saw nothing in the distance but undifferentiated bush. Yet, our safari guide concurred that something of interest lurked out there, so our vehicle lurched forward across the rough turf. And there indeed, a graceful cheetah reclined, little more than her head visible above the tall grass, some 50 feet from us. The world’s fastest animal was concluding a little rest stop in the shade. Our safari party proceeded to grab snapshots, standing up through the dual sunroofs to get a clear view. Thirty feet to our side, another vehicle pulled up, three serious photographers popping through the roof, training their professional long lenses on the same resting cheetah. Soon, our new spotted friend, probably roused by all the attention, stood and stretched. Like a giant living caricature of a house cat, she slowly sauntered toward the open plain. The mysteries of the Masai Mara beckoned her. But, our driver had an idea. He looped out onto the plain and carefully settled the vehicle into a position right in the walking trajectory of our cheetah. When the confident, tall cat cleared the brush, we could see she was quite large, maybe 130 pounds. She moved our way, then stopped close by and looked directly at us. Our cameras clicked away, along with the beat of our hearts. After a thoughtful pause, she seemed to take a skip or two in our direction and then, silently and swiftly, and to our utter amazement, bounded directly up — onto the hood of our vehicle! We were stunned, and all ducked down for safety. There, through the windshield, we saw the long legs and lower body of an enormous spotted cheetah, barely inches away. It was later said that she was the progeny of a cheetah matriarch, who had developed the habit of occasionally hopping onto hoods, roofs and spare tires of safari vehicles. She had likely watched her mother do it from time to time. Taking a breath, one by one we again began to photograph her. She sat down, and soon lay down on the hood. We ducked in again to look through the windshield, and as our guide tried to capture her on his camera phone, our cheetah turned and gazed directly at him. Her giant round reddish-orange eyes seemed almost soft. While we were all thrilled, our new short-eared friend, the cheetah, remained oddly calm and even non-threatening. Like the delicate truce we maintain with our housecats back home, we, both in and on the Land Cruiser, seemed to respect one another’s occupancy of this same small space. There she rested for some five more minutes, as more than a half dozen safari vehicles, probably alerted via radio by the photographers we encountered earlier, circled our location. A dozen heads popped through roofs and cameras clicked away. Was she – posing — for us, and them? Our driver again had an idea. He cautiously waved over another driver he knew, who slowly pulled his vehicle alongside. We handed over my camera. His friend pulled away with the camera, and then, as “our” cheetah again sat up on the hood, he snapped away at us. Thus, the brief, glorious immortalization of that furry “Masai Mara Hood Ornament,” and her fellow passengers. “Our” cheetah soon stood again, wiggling her behind, and sprayed our green hood to “mark” her new mobile territory. She silently hopped down and quickly disappeared onto the plains of her Masai Mara, in search of things unseen by us human interlopers. Back home, near Geneva Lake, Wisconsin, looking over the photos of our lucky encounter, I decided to Google for images using cues like “cheetah sitting on Land Cruiser.” Yes, there were indeed a few shots to be found of cheetahs in various stances on safari vehicles, but not the hundreds of search engine references one might find, if this was a Disneyland photo op. Our breath-taking experience with the lady cheetah was not, after all, a “first” among East Africa wildlife encounters, but it came close enough, even for our seasoned guides. At, as I reach down from my computer keyboard to stroke one of our own needy little housecats, I say to him, “You’re our little cheetah.” Full of indifference to my intercession into his routine, he too saunters off, in the style of his African relative, in silent search of things unseen by this human interloper. But much, much more seriously, and speaking of another, vastly more sinister and deadly breed of interloper, it was less than a decade ago, in 1998, when Kenya snapped into the world’s attention, as a distant and mysteriously dangerous place. It was then that Al Queda terrorists blew up the U.S. embassy in the capital city of Nairobi, killing hundreds. It was an early omen of the 9/11 attacks in America three years later. Nairobi, the largest city in all of east and central Africa, with the world’s second largest slum, has sometimes been called “Nai-robbery,” because of a lingering reputation for street thefts and car jacking. But, the mile-high city, still considered the “safari capital of the world,” has grown into a teeming metropolis and economic center. Its imposing skyline boasts some 46 skyscrapers, and the city offers a vast international airport, magnificent hotels and ultra-luxurious suburbs. And recently, Kenya hasn’t seemed quite so distant. Last fall, we watched as the live TV morning shows broadcast Chicago’s own U.S. Presidential hopeful, Barack Obama, visiting his grandmother at his family’s village near the shores of another great lake, the world’s second largest, Kenya’s Lake Victoria. For a few moments, via satellite, we all joined Obama in the dirt streets of a Kenyan village, as this bright new political force came face to face with his own ancient roots, a world away, yet as close as our morning coffee. But neither global terrorism, nor American politics, begins to define Kenya and its people, who are today grappling with that dichotomy of a naturalistic heritage and an accelerating modern world. All of this is brought into collision by jet fueled transportation, globe-wrapping CNN broadcasts, Hollywood reruns on local Kenyan TV, the intimacy and immediacy of the internet, bundles upon bundles of confused human traditions and aspirations, and, of course, Kenya’s own brand of controversial national politics. So now you see some of the ironic symbolism I felt when we reflected on the curious cheetah that briefly leaped onto the hood of our Toyota Land Cruiser. That rare experience of a living Masai Mara Hood Ornament could have become a tragic encounter, for us and our guides, or for the roaming cheetah. But this time, it turned out all right. Confrontations between big game in their natural habitat and the growing omnipresence of our modern world are increasing in frequency, velocity and risk. And so it is in Kenya, or “Keenya,” as the British called it, in the colonial days after it was known as British East Africa. The size of Texas or France, Kenya lies along the Indian Ocean on Africa’s east coast. War-torn Somalia is to the northeast, Ethiopia to the north, Sudan to the northwest, all in the Greater Horn of Africa. Uganda is to the west and Tanzania, formerly German East Africa, to the south. My wife Vicki and I made our first visit to the Masai Mara in 2004, as an extension into Kenya of a safari organized by Abercrombie and Kent, the renowned Oak Brook and London based expedition company. That safari was called Wings over Tanzania, and included visits to several of the great game reserves of Tanzania, including the vast migratory Serengeti Plain. We were lucky to have as our guide the recently retired Warden of the Serengeti National Park. Our visit to the Masai Mara, itself a northern extension of the Serengeti into Kenya, included game drives through the Masai Mara Reserve. Last year, when we decided to return to see more of the 55 game reserves in Kenya. My interest and knowledge of the conservation of scarce natural resources had grown, largely through my involvement as chairman of the Geneva Lake Conservancy in southeastern Wisconsin. So I asked A&K if they would make some conservation connections for me in Kenya. Upon our arrival in Nairobi, we breakfasted with Asgar Pathan, the Executive Director in Kenya of Friends of Conservation, a global not-for- profit organization founded by A&K. Conservationists in Africa face many issues. For example, advancing droughts of recent years there, which have impacted the food supply, have introduced new calls for a return to legalized big game hunting in Kenya, where it has been banned since 1977. Asgar describes the wealth of much of the African continent, and certainly Kenya, as being in its “mega-fauna,” the teaming herds, predators and scavengers, and the colorful monkeys and birds. Yet in 2005 there was a “Big Game” bill tabled in the Kenyan parliament on “Consumptive Utilization of Wildlife,” to re-introduce big-game hunting. It proposed to boost the food sources for locals, but also to boost the local economy. Those opposed argued that lifting the ban on hunting could jeopardize survival of Kenya’s wildlife and negatively affect the tourism industry. Recently, U.S. hunting interests have again sponsored tours by members of Kenya’s parliament from wildlife dominated areas, along with Kenyan journalists, to countries in South Africa that permit big game hunting. Asgar brought out some compelling facts to support the thesis that photographic safari’s are of vastly greater local benefit than hunting safaris. This was just one of many opportunities Asgar cited for the conservation of what he termed “natural heritage resources” in Kenya. Big game tourism provides Kenya the opportunity to communicate and interpret the values of these living resources to visitors, helping to create a new, more informed and responsible generation of travelers. In a study in Botswana, where the two safari formats are both legal, it was determined through a comparative study, that photo safaris created 10 times the local jobs and wages as hunting safaris. Photo safaris accommodated nearly 100 times the guests, and vastly increased local safari revenues, as compared with hunting safaris. With a population of 30 million, to this day Kenya relies on big game tourism for the “lion’s share” of its economic trade with the world. The earnings from Kenya’s tourism sector will hit $1 billion within a year. Tourism is and has been for some time the largest foreign exchange earner for the nation, after tea exports, and is the second largest contributor to the local economy, after agriculture. Nearly 15% of employment is in support of big game tourism. Today, ten percent of Kenya’s land is set aside for conservation of wildlife and biodiversity. More and more, agriculture is replacing traditional nomadic grazing, which serves to crowd the game reserves and wildlife refuges that sustain the economy. Organized poaching is still a problem, both for local illegal sale of meat, called “bush meat,” and international trade in hides and tusks. The country has insufficient tourist beds, some lingering security issues and an insufficient internal transport infrastructure, according to the World Bank, which results in daily tourist spending less than that in neighboring Uganda and Tanzania. Last fall, my wife and I served on the steering committee for an event called the Conservation Ball. It is held annually in Chicago by the not-for-profit group, the Friends of Conservation. They used the event to launch a one million dollar Global Climate Change Challenge. It is a fund-raising initiative to try to deal with some of the climatic issues in East Africa and other areas around the world. The guest speaker was Richard Leakey, the renowned paleoanthropoligist, former director of the National Museum of Kenya and of the Kenya Wildlife Service. Yes, he is the 64-year-old inheritor of the legacy of famed fossil hunters Louis and Mary Leakey. Richard has devoted his life, as did his parents, to helping conserve the habitats of wild species in Africa and elsewhere. He observed that many byproducts of human activities, such as carbon spewing into the atmosphere, have a negative impact. But he went on to share his view that the human race, our very species, might not be what and where we are today but for naturally caused climate change, in earlier prehistoric times. The first of such changes was 2.6 million years ago, when the response to fairly rapid desiccation or drought was the development of the earliest record of technology – the first time primates started to use sharp edges to access a meat diet. Some of you may have participated in the National Geographic Society’s Genographic Project, a landmark DNA study of the human journey out of Africa to populate the world. Vicki and I sent our DNA samples in, and found the portions of Africa from whence our earliest descendants moved on into Europe. The last major pre-historic climate change, and one that still affects us, occurred just 8 or 9 thousand years ago, when humans around the world underwent pressures from desiccation that led to the domestication of plants and animals. The difference is that in previous times there were relatively few people to be effected by climate change, but today it can affect an enormous population – some 6 to 8 billion people across the continents. He believes that today there are far too many people on the planet to absorb such change, particularly if we go through a period of years when rainfall patterns change dramatically, mean temperatures rise, and most significantly, ocean levels also begin to rise. Regarding the implications for Africa, if the continent’s great wildlife is to be saved, we have to mitigate and deal with some of the issues that will threaten it. Droughts and floods of historic proportions are becoming more commonplace in Kenya, perhaps as a consequence of global warming. As climates dry, people will move increasingly to forests and wet areas. Leakey commented that many of the rivers that used to flow when he was a boy no longer flow, because people have settled in the catchment areas. I saw this underway, as I visited parched areas of the Masai Mara last March, when the annual spring rains failed to materialize. Over the next five years, Leakey believes the Mara River, site of the great wildebeest crossings, could dry out for at least six months of the year. If that were to happen, the future of the Mara, as a part of the vast Serengeti/Mara ecosystem, would be dim. Planting trees and educating teachers and young people are steps that, in part, could help arrest the current trend. It’s not going to stop climate change, but such steps could enable the environment there to be less affected. Last March we visited the Friend’s of Conservation Environmental Learning Center for the Greater Masai Mara. It’s a compound at the edge of Talek Village, just outside the safari reserve. It is operated by bright 20-something Masai officers of the Friends of Conservation. One young leader was the daughter of a local Masai chief, and another was a bright young man who had returned from Oxford to help his tribe deal with climate change. They were operating a reforestation demonstration project, and gave us the chance to join in the planting of a tree in their nursery. They showed us a model Masai hut of the future, made with more clay and less wattle, reinforced windows for fresh air, and a new simple design for a clay cooking fireplace, that uses 70% less wood for fuel than the age-old model. Young women were learning to produce and sell honey to generate household income, while young men were learning why they should sell off some of their prized cattle when droughts are expected, so they would not be so financially decimated by drought, as often happens now. Production of biogas fuel using cow dung was being demonstrated – fortunately downwind of our location. In addition to Leakey’s comments that the rivers are increasingly drying and oceans rising, he noted that lakes are disappearing. Western Kenya’s Lake Victoria, the second largest fresh water lake in the world after Lake Baikal in Russia, is now about 15 feet lower than its typical recorded heights over the past 100 years. We flew in to Lake Victoria, which is the source of the Nile River, and visited a beautiful, remote small resort on Ruzinga Island. Their gently sweeping lawn down to the lake had grown by some 50 feet in just a few years and their fishing boat dock now had an equal extension out into the receding lake. It’s increasingly likely that Lake Victoria may no longer be able to generate sufficient electricity in the hydroelectric falls that supply portions of Uganda and Kenya. The implications are enormous. Global warming will also have some terrible consequences in Africa’s great mountains. Kilimanjaro, the highest mount in all of Africa, of Hemingway’s “Snows of Kilimanjaro” fame, has always had snowcap ice on its 19,000 foot summit. The last remnants of the glaciers on Kilimanjaro, as well as on Mount Kenya, this country’s highest peak, will likely, if current trends continue, have melted by 2020, or sooner. Leakey believes that for the first time in 10,000 years, there will be no permanent ice on these iconic mountains. When we made a game drive across the plain at the base of Mount Kenya, high atop the equator, I photographed a lion, lying in the grass, with the glacier-topped peak the indigenous peoples call Mount Kirinyaga, or “white mountain,” in the background. The local Kamba people pronounce the extinct volcano Kirinyaga as “Kiinyaa,” which ultimately lent its name to the mountain, the nation and even to its first president, the legendary Jomo Kenyatta. One of the stops on our recent trip was to a remote retreat made famous by its owner, movie star William Holden, and his Hollywood friends. The Mount Kenya Safari Club sprawls as a complex of low whitewashed buildings amidst vast lawns and golf links on the approach to the great mountain. While there, we toured the adjacent Animal orphanage, founded by Holden and currently chaired by actress Stephanie Powers. A variety of animals and birds, cheetah, chimps, dwarf rhinos, giant tortoise and ostrich, which were brought in injured or orphaned, roam the grounds in a sort of African touching zoo. It is supported by guests to the Safari Club and counts a worldwide membership. More than 100,000 Kenyan students have had a chance to visit this animal orphanage. They interact and learn about the animals, develop a respect and appreciation that abates poaching, and increases chances of such wildlife surviving in their modernizing world. One species that really caught our eye was the exotic bongo. These spectacular mountain antelopes have vertical white stripes on a brilliant russet coat, horns that may reach 40 inches and large soft multi-colored ears. Bongos are a threatened species, partly because they became a prized hunting trophy by sportsmen, even more than the famed “Big Five” of Africa – elephant, lion, Cape buffalo, rhino and the elusive leopard. The natural predators of the bongo include lions and hyenas. When the bongos were threatened with extinction some 35 years ago, William Holden set to capture 20 young mountain bongos. A decade of planning and executing went into his effort to save the animals from extinction. With the Kenyan government’s help, he sent them to a group of U.S. zoos to form the nucleus of a breeding program, to establish gene pools for eventual safe return to their natural habitat. The first herd of bongos with Kenyan ancestry was returned to Kenya in 2004, and the animals have been bred locally since. They are just now being re-aclimated to the wild foothill forests of Mount Kenya, which are now free of both hunters and lions. While visiting the Mount Kenya Wildlife Conservancy, we saw several bongo families being raised, and decided to sponsor a big-eared and curious young male, born on the mountain in January 2006, which we named Raha, the Swahili name for Joy. As we traveled across the country, our hostelries, beyond the grand old Norfolk Hotel in Nairobi, were tented camps, and set in the midst of the habitat’s we were visiting. From our sleeping tent, we would often hear chimps scampering overhead during the night, or hippos bellowing in a nearby stream, or on one occasion, a lion roaring as he strolled through the camp, under the watchful eyes of armed Masai warriors serving as our security contingent. The tents were usually set up “Hemingway” style, and included an outer waterproof tent and an inner tent with zippered screens. There’d be a shaded porch at the front, with safari chairs and a shaving bowl. Inside were two wooden mattressed beds with mosquito netting, solar lights and rugs. Then another connected tented chamber featured a mirrored sink, mahogany carved toilet and a separate zippered shower, served by a hand-filled canvas bucket overhead. Meals were taken at a communal outside table, but at night or in inclement weather, a dining tent, complete with bar and buffet and native paintings, served as our social center. Of course, a semi-circle of canvas chairs around a roaring fire under the stars, with gin and tonics or a glass of excellent South African wine, is where most evenings began and ended. Sometimes the night’s entertainment included elephants grazing or hippos splashing in the background, or some leaping and dancing demonstrations by the local Maasai in their native dress. One night, an armed guard escorted us to our tent via a circuitous route, because a giant horned cape buffalo was lazing along “our” path. One morning, we rose at dawn, but were delightfully delayed in departure for the breakfast tent by two young elephants, busy pulling at tree branches for their own breakfast a few feet in front of our sleeping tent. But I must add the perspective that in our two safaris to east Africa, everything has been professionally managed for us by competent, well- prepared escorts. We’ve never had a serious incident nor felt unprotected. If travel arrangements are made through a professional organization with local expertise, risks can be minimized. Meanwhile, back at the Mara, the local ecosystem is now under growing stress. According to rangers, roads are in serious disrepair in places, animals are being harassed, as perhaps our otherwise charming encounter with the cheetah illustrates, and off road driving is damaging grasslands. During heavy rains last December, roads became impassable, and some tourists were stuck for many hours in bogged-down vans, surrounded by wildlife. The highly popular Masai Mara Game Reserve may soon be put off-limits to budget travelers, through higher charges for park entrance fees, hotels and taxes. This is to reduce the influx of tourists, restoring a “high yield” reputation to the area, while reducing the impact of man. Biodiversity for the benefit of mankind requires legislation and policies in place. In contrast to earlier conservation policies, ecosystem management is based on a paradigm of nature in flux, or change, rather than balance, and a view of people as part of, rather than separate from nature. Politically, Kenya is still a young nation. It was only in 1894 when it first became a British protectorate, and came under the influence of colorful Lost Lions of the Empire, such as Cape to Cairo Grogan and Lord Delamere. The giant capital of Nairobi in the year 1900 was little more than a whistle stop at the end to the western terminus of the rickety rail line, known as the Lunatic Line, from Mombasa on the Indian Ocean. Lord Hindlip, an early settler, was convinced that Nairobi was the result of some “momentary mental aberration” a dismal site that had greatness thrust upon it. Nairobi was a dust bowl in the dry season. When the rains came, the whole place became a swamp, “the home of innumerable frogs,” and a breeding ground for malarial mosquitoes. In some ways, not everything has changed, because on our latest trip, when we checked into a delightful room on the inner court of the Norfolk Hotel, the garden outside the window was echoing to the groans of a thousand frogs. After 50 years of largely blundering British rule, the infamous and bloody Mau Mau independence movement was underway, led by the charismatic Jomo Kenyatta. Kenyatta went on to become the first president of Kenya, and in 1964 the country became fully independent. But Kenya’s current multi-party system is still plagued with inefficiency and graft. Competition for scarce natural resources is resulting in resurgence in tribalism and even regional loss of life. Graft, bribery, patronage and embezzlement are still too much of what I call the “baksheesh” way of life in Kenya. Some diplomats estimate that Kenya has lost a billion dollars through official corruption over the past three years alone. A Transparency International survey of perceived corruption last year rated Kenya 142, just ahead of Kyrgyzstan, out of 163 countries. The U.S., by comparison, rated 20th, tied with Chile. Current President Kibaki was elected in 2002 on a pledge to clean up Kenya, but diplomats say that “massive looting” is still underway. Kenya’s anti- corruption czar recently resigned his post amid reports that his life has been threatened. This February, the U.S. issued another in a series of recent travel warnings to U.S. citizens planning to visit Kenya, citing current risks of criminal attack and terrorism. Kenyans deny any risks for tourists. There you have some reasons that over the latest two years, neighboring Tanzania and even Uganda, attracted 10 times the foreign investment. Yet the government of Kenya is optimistically pushing forward for greater industrialization, aiming at achieving newly industrialized nation status by 2020. As I observed at the outset, Kenya is a complex society, and as you now see clearly, a much less than perfect one. The Serengeti – Masai Mara ecosystem is one of the last in the world in which human impact is still less than 5 percent. Their endless arrays of ecology are the staging ground for natural cycles of life, death and regeneration as old as the planet itself. Kenya provides a natural and ancient habitat to the great beasts of the wild, and to proud native peoples who are struggling with a dangerous and puzzling overlapping dependence on modern and ancient cultures. Eco- tourism is gaining ground, just as modern agriculture is invading big game habitats. To help deal with a continuing poaching problem, a Global Wildlife Coalition of conservation organizations and governments has just been announced. The UN also just announced that the global headquarters for its environmental program, with more than 7,000 local employees, would remain in Nairobi and retain a regional focus. Sustainable tourism in Kenya can only flourish if even more ways are found to take care of the valuable and fragile environment, and adjust to inevitable climate change. The tourism influx is expected to top one million this year, after lagging for decades. Nearly 100 thousand Americans will visit Kenya as tourists in 2007, less than a decade after the U.S. embassy bombing. This is good news for the local economy, and adds resources for conservation, yet at the same time puts added pressure on natural habitats. In the episode which I related at the outset tonight, I shared with you our close encounter with a cheetah, which led me to call this essay “The Masai Mara Hood Ornament.” That analogy expresses my delight in seeing such great creatures, alive and up close. But it also expresses my growing concern that man and his technology create a danger of crowding out these living, moving wonders. In fact, locals in the big game reserves of Kenya sometimes use the term van-de-beasts, to refer to the ever-increasing “herds” of tourist mini-buses. Before the van-de-beasts descend tonight to spirit me away, I’d like to conclude this cautionary, but I hope informative, status report on far-away Kenya. It is a magical land, deserving of accelerated conservation and an honored place in the complex world order. It is certainly worthy of a visit, to meet the bright and friendly people, and understand firsthand the value and primal beauty of fantastic wildlife in its awe-inspiring natural habitat. Kenya has earned its place as one of the world’s fastest-growing eco-tourism destinations. If and when you plan to go on safari, please tread lightly, because Kenya’s many challenges and dichotomies are not just Kenya’s alone to solve – they are also the world’s problems and the world’s opportunities. So, using the Swahili expression for “thank you very much,” I’ll say, Asante sana, and in their words for “good night and good bye,” I say to you, Usika mwema na kwaheri.